CRASH CLOGS INTERSTATE: Firefighters and paramedics attend to Gary Holman, 54, Cabool, Missouri, about 4:30 p.m. Friday after his semi-tractor-trailer overturned in a ditch on Interstate 65 about four miles south of Lebanon. Holman told police he fell asleep. The truck was loaded with 30,000 pounds of tires. Holman sustained a head laceration and complained of general pain. He was taken to Witham Hospital, Lebanon, for treatment. Units from the Lebanon, Whitestown and Zionsville fire departments, Boone County Sheriff's Office, Lebanon Police, Indiana State Police and Boone County EMS responded. 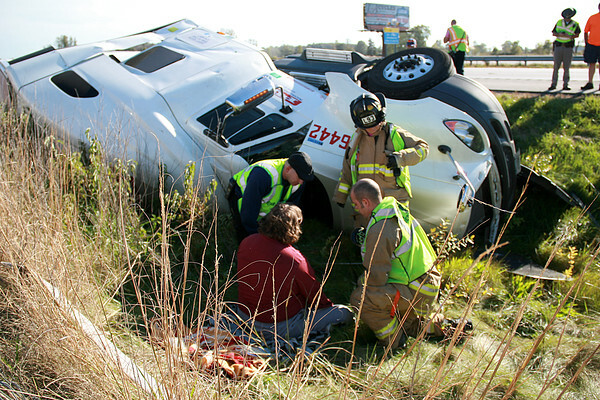 Traffic north bound on I-65 was restricted to the two far left-hand lanes for several hours.